QuickBooks Desktop Premier, QuickBooks Accountant (QBA), Enterprise Solutions Accountant (QBESA), and Quickbooks Enterprise Solutions (QBES) have the Toggle feature. 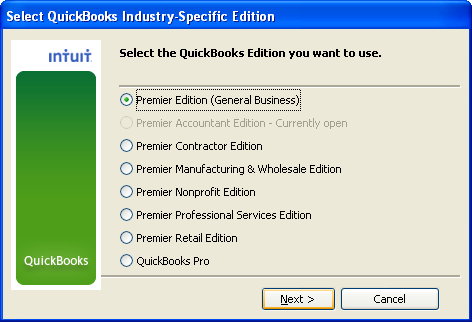 This enables you to change your QuickBooks Desktop edition from a specific industry to another. From the Help menu, choose Manage My License. Choose Change to a Different Industry Edition. Select the industry edition you wish to switch to. QuickBooks will take a few moments to configure and will re-launch in the selected version. From the File menu, select Toggle to Another Edition. Choose the edition, then click Next. If the QuickBooks edition is grayed out, you need to Repair QuickBooks to replace all damaged QuickBooks components and its installation files. If the issue persists, Reinstall using a clean install.